Café Casino is about taking you away from the usual grind of your work routine. The website gives you a place to kick back and enjoy a full array of games that will give you the escape you need. You can further enjoy these games with a large bonus just waiting for you when you sign up. 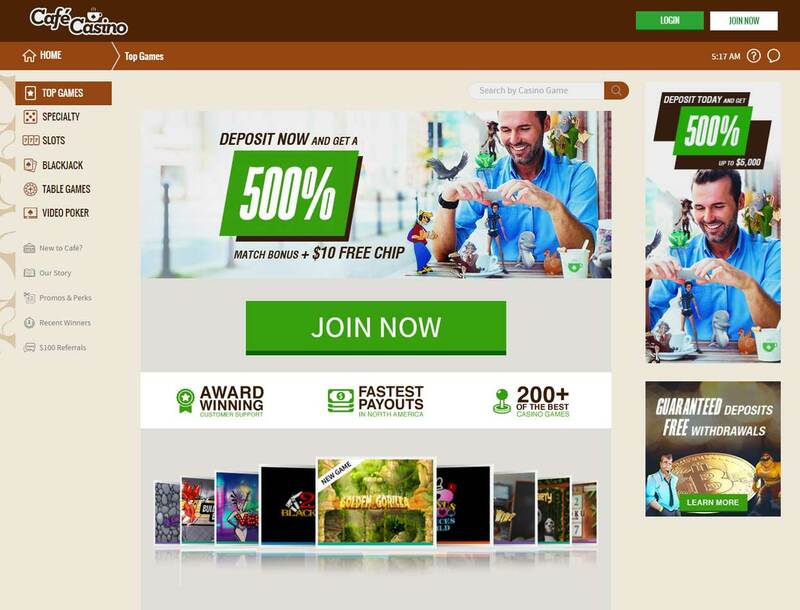 This Bitcoin slots review will take a careful look at Café Casino. 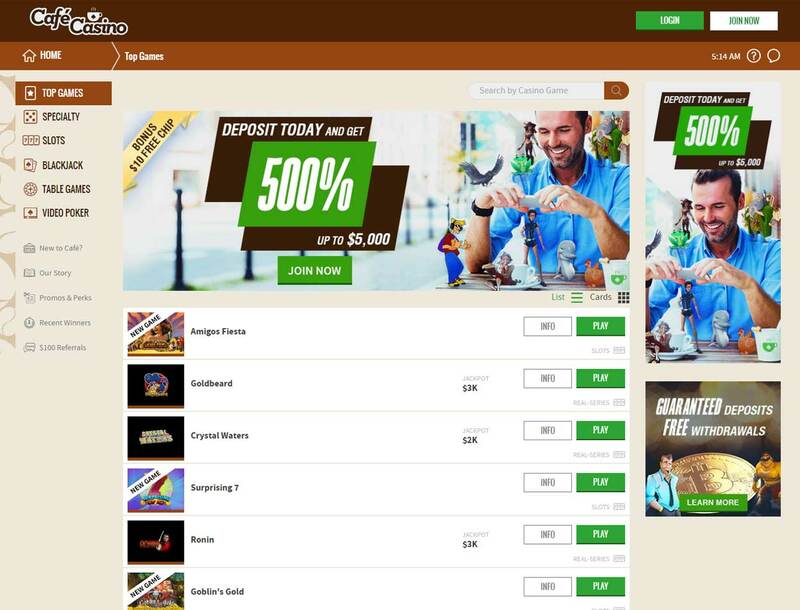 There are hundreds of Bitcoin slots to choose from in Café Casino. All of these come from Rival, Real Time Gaming, and Genesis Gaming. When it comes to slots, these three knows how to make the best looking ones that are also fun to play. You will find a large variety of these slots in the casino that has its own themes and features that are different from each other. If you are looking for something familiar to cozy up with, you will find all of the old favorites in this slots casino like Texas Hold’em, blackjack, and roulette. You will even find different versions of these favorites that have its own unique rules to make the game more interesting. When you want to be bold with a different kind of gambling game, the Specialty section has your back. You will find a set of bingo games with various rules and scratch card games. The ones to check out are Rival’s Sudoku and Pirates Pillage. These two provide new type gambling games the norm. Café Casino is bursting with a ton of promotions. One of which is the welcome bonus that you get when you sign in. You can choose to get a 500% bonus up to $5,000 on your first deposit or just a 100% up to $1,000 bonus. Each of these bonuses is convertible to cash. To turn the 500% bonus to cash you need to wager the bonus and deposit amount about 35 times. You also only have 10 maximum cash out for the slots bonus. For the 100% bonus, you can turn this into cash by wagering the amount of the bonus and deposit about 25 times. There is also no maximum cash out for this bonus. Café Casino lets you send in your Bitcoin via the address that connects to your account. 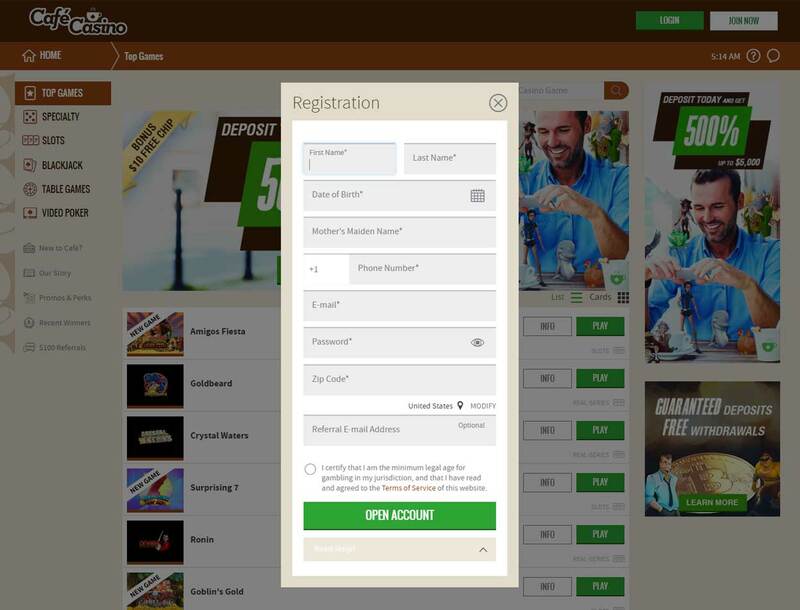 You will also enjoy withdrawing your winnings through the digital currency. There are no fees when you take out your Bitcoin from the casino. 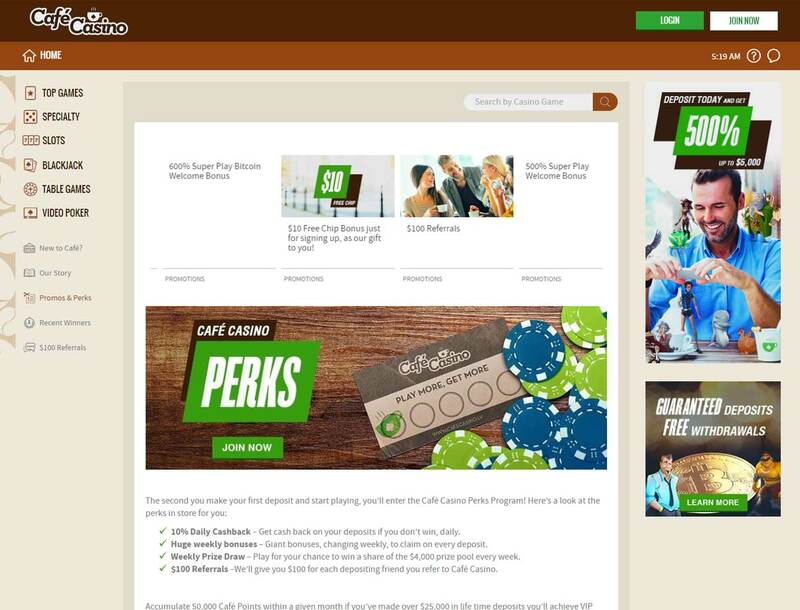 You can get in touch with a Café Casino support team via a toll free number and a live chat feature. The support team is available 24/7.